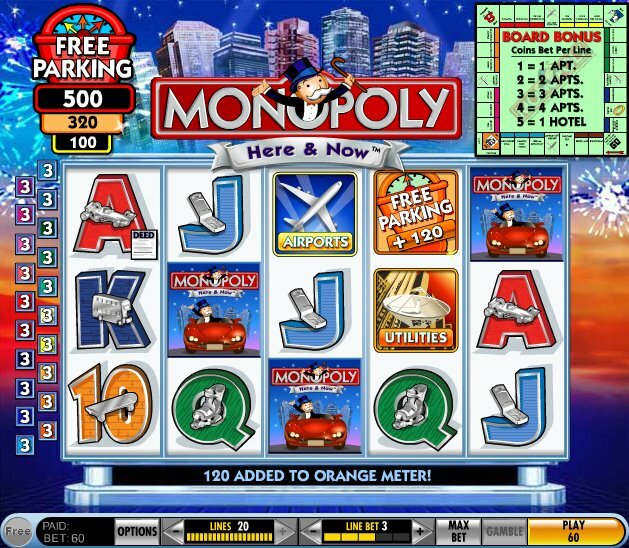 Monopoly Here & Now Slots is a high risk – high reward slot machine. This is because the smaller payouts are pretty small, but the larger payouts are pretty high. The slot machine lets you take the max bet all the way up to 100, unlike its brother slot, Monopoly Slots. This slot machine is loaded with bonuses and extras and is a really fun slot machine to play. The 20 different pay lines do there part in making sure combinations fall on pay lines pretty often. The graphics aren’t as good as Monopoly Slots but they are still pretty good – especially since the game isn’t played on downloadable software. The wild symbol in this game is a picture of the Monopoly man with the word “wild” stamped over him. The symbol substitutes for all other symbols except for the bonus triggers and the “free parking” symbols. It is not a multiplier symbol and there is no scatter symbol in this game. There are symbols on the boards that have a little picture of a “deed” in the bottom right corner. If you get three of them in the first three reels then you earn a random deed and you can see which one you have one on the little miniature monopoly board. The corresponding property earns you an upgrade. Your line bet on the winning sub-symbol line determines how big of an upgrade you will receive on that property – and just like the regular game it goes from 1 to 4 houses to a hotel. One of the unimproved properties is randomly chosen to earn an upgrade when a property upgrade is earned. In the case where all properties have been upgraded, the game randomly chooses one of the already upgraded properties to receive more apartments or another hotel. The Free Parking Bonus meters can be seen in the upper left corner of the game screen. There are yellow, orange, and red Free Parking symbols that increase the bonus meters with the amount shown on the symbols in the last three reels. The Free Parking meters start at 100, 200, and 500 when you start playing the game. Additional credits add to the jackpot accumulator if the pay line that first activates the Board Bonus has 2 or more credits. This game also has the “gamble” feature. After every win that is under 3,000, you have the choice to pick the color of a card. If you guess it right then you winnings double, but if you guess it wrong then you lose it all. This slot machine can be very fun. It’s almost like playing the original board game except for this time you are playing for real money, not monopoly money!